The room has a cold feel to it with walls that are white and crisp, reflecting poise and professionalism, but the yellowish light and welcoming atmosphere exudes warm acceptance. 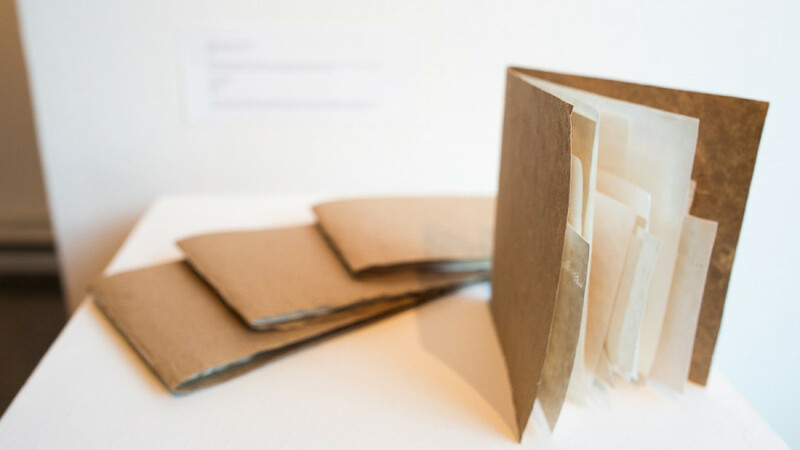 Eight pieces created by seven artists adorn the small space that is the Mile End Gallery for the event Bookworks. They were all given their respective area to speak their own conversation, all while complementing each other. Bookworks was an event that took place in the Art Matters festival with Concordia University. Featuring works made by Concordia students, this event was one of many that took place during the month of March. Curator Maia Donnelly decided on an exhibition that featured book art as an homage for for her long standing love of books. This unique form of art is defined as all art that use the book form as its basis. 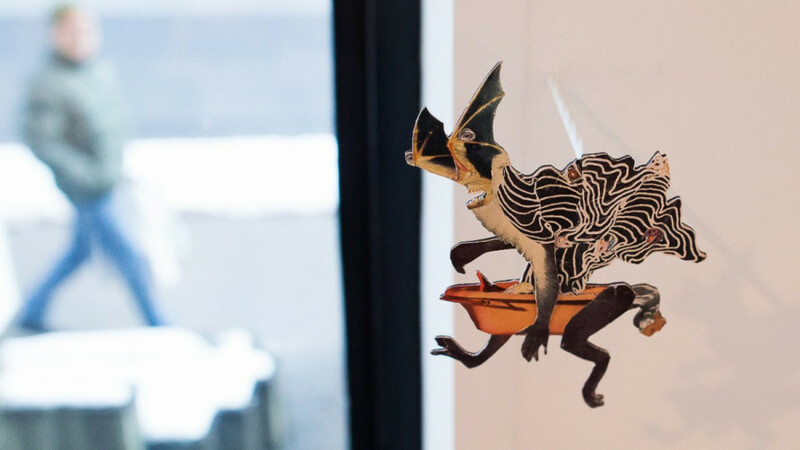 Small creatures climb along the back wall of the space as part of a cohesive and strange art piece called “Palimpset” by Guillaume Bégin. 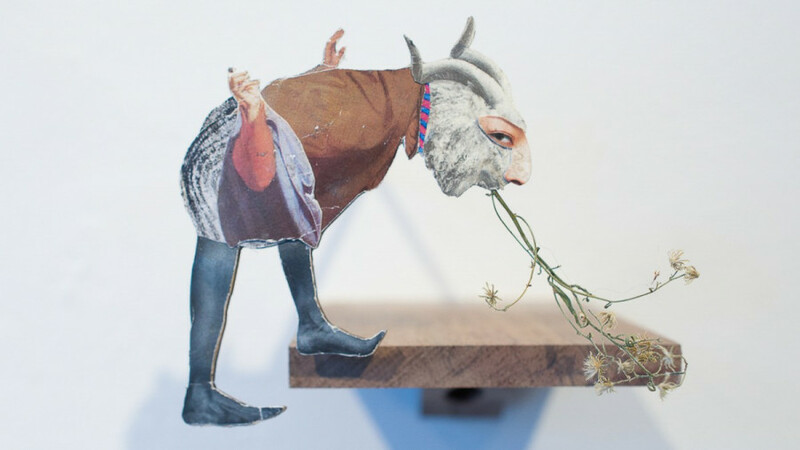 Chosen for the exhibition for the character concept of a novel, explained Donnelly, these creatures, a mishmash of human, animal, and object figures, create their own world. Indirectly stuck to the wall, the shadows cast by these pieces are art in and of themselves, creating an upside-down deformity, and are sometimes doubled depending on the angle of the light. In the center of the room rest three thin books on a white table, one of which is a piece called “Memory Chambers” by Andrea Cormier. Each page in Cormier’s book shows a beautiful, quiet photograph of a different room, whose characteristics speak of the character of the owner. 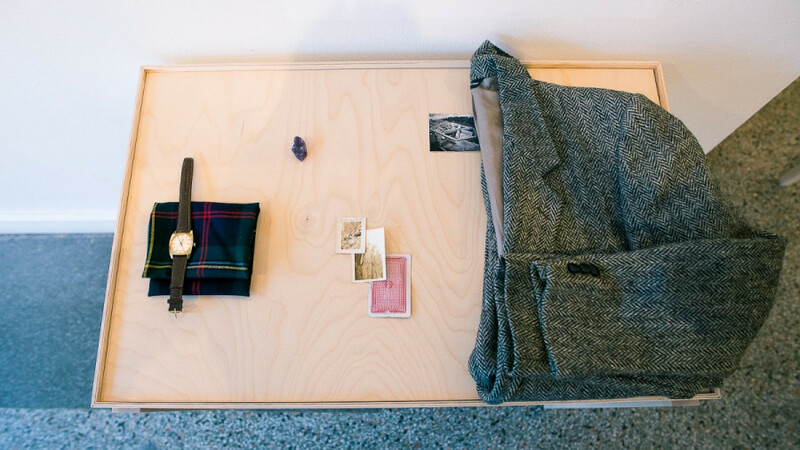 Some beds are unmade, others tidy, but each photo would evoke stillness and relaxation. The idea for “Memory Chambers” came from a recurring dream of hers. “I would visit a house and want to explore every room. And, in every room there would be objects that were familiar to me. It was a house that was kind of familiar, but not enough for me to be able to pinpoint where, or in what context,” Cormier explained. This book she created was originally made for a class, she said. The course was called Wanderlust, and was available through Concordia’s Fine Arts department. Their class went on a trip for a weekend to Stanstead, Quebec. The class used those few days to come up with a project. Cormier decided to use the space of their residency to create a narrative. The house was made up of about 40 rooms. “I wanted to work with the house, and use it as a metaphor for the different chambers in the mind,” said Cormier. As she would visit the rooms of the house in Stanstead, an aspect of the room would always incite a memory, or remind her of someone, she said. So throughout her stay, she kept a journal to jot down the experience. It started off as a collection of poems, but ended up as prose. At the end of the trip, she pieced the journal entries into a story. It was an emotional project, because she had to revisit some memories of people and experiences from the past, but it ended up giving her some closure. Donnelly mused about the final product of the exhibition. “The basic idea I had pitched at first was art as books, which expanded from the traditional codex form. But I did end up including artist books in the codex form, because there were many that I did like,” she said. On the left hand side of the room, directly perpendicular to Bégin’s “Palmiset” sat Alex Apostolidis’ work “nineteen/eight.” The piece was in book form, sitting on a little table, and expanded in poster form along the wall. The piece consisted of eight 35mm photographs that were screen printed onto MASA rice paper. The photographs were either abstract or straightforward and were all taken in 2017. Although at first, Apostolidis had not intended to print them for any project. Apostolidis explained that their book is about how you only grow up once. They decided to make the book in a way that you can safely take out the pages without damaging it, and display them somewhere. The event exposed its audience to the unique art form of book art, with beautiful abstract pieces. There is art behind the meaning of every piece and every page.